The definition: To stand up or stand again, referring to physical resurrection of the body, or cultural resurrection as an uprising against an oppressive force. A performance about the quest for Resurrection, and the need for Insurrection. In general, I explore natural cycles, social currents, sustainability and potential. My current body of work examines visible, invisible and psychological structures. 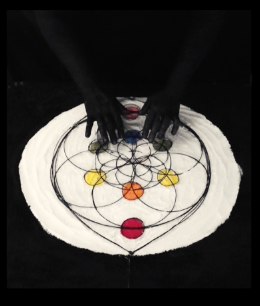 I create visual experiments that exist in between the realms of body mind and spirit through careful observation, in depth research, and meaningful communication with the world around me. Most recently I have been researching mythology and alchemy through archeology and artifacts that illustrate sacred and scientific truths simultaneously. In this piece I hope to ritualize a process for returning gunpowder to it’s rightful alchemic origins: a quest for immortality through the investigation of cosmic dust... by exploring the reality of our experience with it, one of violence, discomfort and death.